George is in hospital after crashing into a skateboarder. Eileen is upset that George is in hospital. Danny misses an important phone call. Max is very upset. Shane tells Danny that it's not the end of the world - he can talk to Max when he calms down. But Danny says he and Max just can't communicate. He heads off to school. Danny says Max reckons he's going to ring up the French teacher (Miss Drew) and tell her how to teach French properly. SCOTT: She's pretty old. Thirty at least. DANNY: Too old for us. Too young for Dad. Scott starts to make up a limerick about Miss Drew. "Our French teacher's name is Miss Drew...with Max she's having a blue"
Max is in a better mood this morning. Shane thinks he came down a bit heavy on Danny - and the bloke rang back and gave Max the job anyway. He says that Danny is getting low self-esteem and Max had better start helping him. Shane warns Max to stop playing favourites between Shane and Danny. Max says that Shane didn't do anything to make him angry, but Shane says that Max doesn't take notice even when Danny is in the right. Shane thinks it's because Danny isn't Max's real son. Max says it's rubbish, he has grown to love Danny and he doesn't want to lose him. He gets a bit upset. Shane tells Max to tell Danny how much he loves him, but Max doesn't know how to. 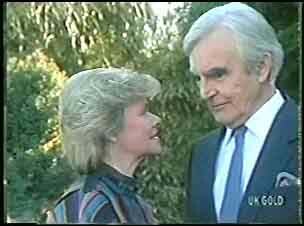 Helen urges Jim to make up with his mother. Danny hasn't had a very good day in school - his French teacher isn't speaking to him. Just then a bloke pulls up in his car and offers them a ride. Scott isn't keen, but Danny gets in. The bloke drops Danny and some other boys off. Suddenly Danny realises that the car is stolen. The bloke warns him not to tell the cops. The bloke suggests Danny gets the car next time. Danny says he'll think about it and walks away. Scott tells Shane that he suspects the car was stolen. Danny walks by and into the house. Shane says he'll have to knock some sense into him. 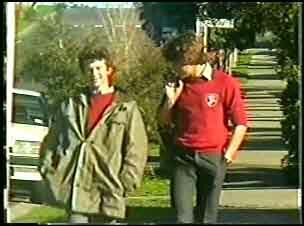 Shane tells Danny off about the stolen car. Danny says it's none of Shane's business, but Shane says he doesn't want Danny heading for the gutter - he's worried about him. He says Danny is lashing out at everyone. Danny admits he is being a bit of a pain. Shane says no-one is perfect and Danny shouldn't beat himself up all the time. Max is chatting to Scott and Jim about Danny. He feels he isn't handling things too well. Scott tells Max that Danny is really down at the moment. Just then, Douglas Blake arrives. 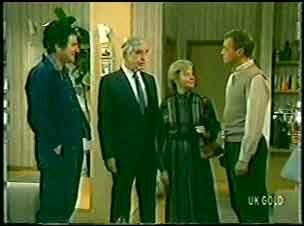 Max recognises him from a plumbing job he did once and apologises for the misunderstanding about Douglas's sister. Douglas says he has a surprise for Helen. 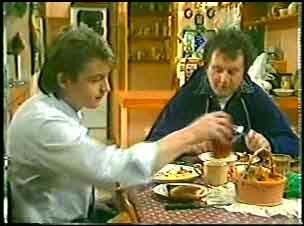 When they've gone, Max advises Jim to start reading cookery books! 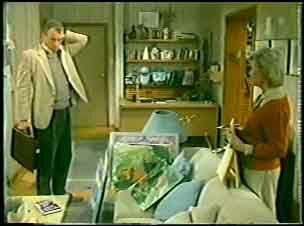 Douglas tells Helen that they're going to forget about art for the day and concentrate on each other. Helen's choice. She suggests tandem hang-gliding(!) but settles for a walk by the river. Max and Jim and having a cup of tea and chatting about their families. He says he's not sure what Shane is going to do with his life. Scott says he knows what he wants to do now - be a biographer. Just then Danny comes in. He's surprised to see Max there. He starts going on about the French teacher and Scott tells him the limerick. Max laughs and Danny looks a bit happier. He and Scott go off to Scott's room. Scott is showing Danny his research for his article. Danny apologises to Scott for getting in the car - he didn't know it was stolen until later. Scott advises Danny to keep clear of Leo. Danny says that Leo and his mates are jerks. Bess comes in - she's brought some more stuff over for Scott. She says that Jim must be very proud of his family. She says Jim is so like his father - it's sad that he died before Jim was old enough to remember him. Danny is trying out Scott's typewriter. 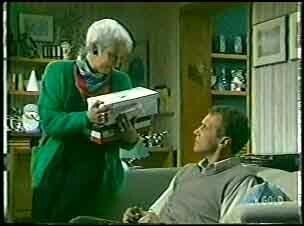 Bess comes in with some boxes of papers for Scott. When Danny and Scott look in the boxes, they're full of photos. DANNY: Wow! Is that your nan on an elephant? 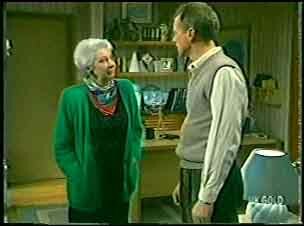 Bess tells Jim that she's going back to the motel to start packing. Jim asks her to settle down for a bit, but Bess says she's been a nomad all her life and doesn't want to stop now. She doesn't travel because she has to, but because she likes it. Jim says he can't understand her life, but Bess says neither of their lives are wrong, just different. Danny finds a letter in the box. He looks alarmed and shows it to Scott. DANNY: Scott. Why didn't you tell me about your nan? She looks so healthy. Scott takes the letter and starts to read it.